Happy Friday the 13th! Last week, a coworker and I devised a plan to dress up in black today and order Hell’s Pizza for lunch. Almost everyone at work agreed to join in so it must have been a good idea. Hope you enjoy yourself a kooky-fun day too! Today’s slightly morbid, semi-gory post is in response to this post. “Way, way back in the late ’80s, a young boy at Glenholme Primary School in Rotorua, New Zealand accidentally slammed his fingers in the classroom door. I will never forget it because he also happened to be holding a tamarillo at that precise moment. Until I shared my tamarillo memory, I didn’t realise that tamarillo were uncommon in other parts of the world. A little research suggests that it is is known elsewhere as the tree tomato or the Dutch eggplant. A wiki entry suggests that tamarillo is a unique commercial name here in New Zealand. 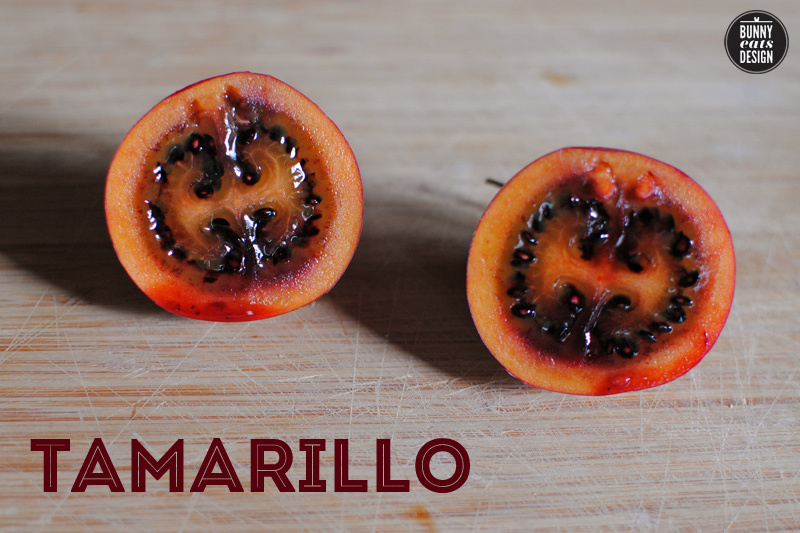 Eva in particular wanted to know what the tamarillo looks like cut and also, what does it taste like? Well, I hope the photos show how it looks like cut and the scooped out and smashed fruit convinces you how gory the fruit can look. How does it taste? 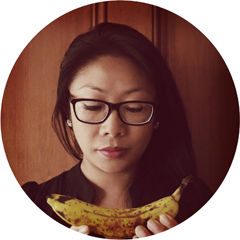 A little sweet, quite tart but the main flavour is a mouth filling, saliva enticing savoury. The Koala said that he eats it with a sprinkling of sugar but I never did. It would a great one for experimenting and cooking with. I only had two so we ate them “raw”. Oh and there’s also this horrifying photo of a rabbit eating a cherry. I thought it should probably go here. I don’t claim to own this picture (because I don’t) but I think it’s suitably fruitably gory. Thank you so much Genie for the cut photo, they are indeed rather interesting. We have a very large grocery store downtown and they often have exotic and unique offerings, so I’ll keep my eyes open for these. It’s still Thursday in these parts, but Happy Friday the 13th to you. Gross regarding the finger guts. lol. I’m glad you share my sentiment on the gross finger guts. Now that I look at it, I can’t imagine dealing with tamarillo at the site of an injury. Hahaha poor boy! Plus, what a photo of this rabbit! Fantastic! 🙂 The funny thing is that (as I was bought up in Australian) Friday the 13th is the bad luck day for me. BUT, in Spain they celebrate Tuesday the 13th as the bad luck day instead… I’ll have to figure out why. It’s supposed to be bad luck here too but black in New Zealand has different connotations because it is our sporting colour. Black in NZ is festive and patriotic. I’ve never head of Tuesday the 13th being a bad luck day. I wonder if it a Catholic tradition? I’ve never seen a green tamarillo. I do wonder if they are the same fruit at different stages. Like green/yellow/orange/red capsicum! Halloween is coming, that cherried rabbit could be quite the costume! omg at the cherry-eating rabbit – I’m just about to sleep and that probably wasn’t the best thing to have seen! 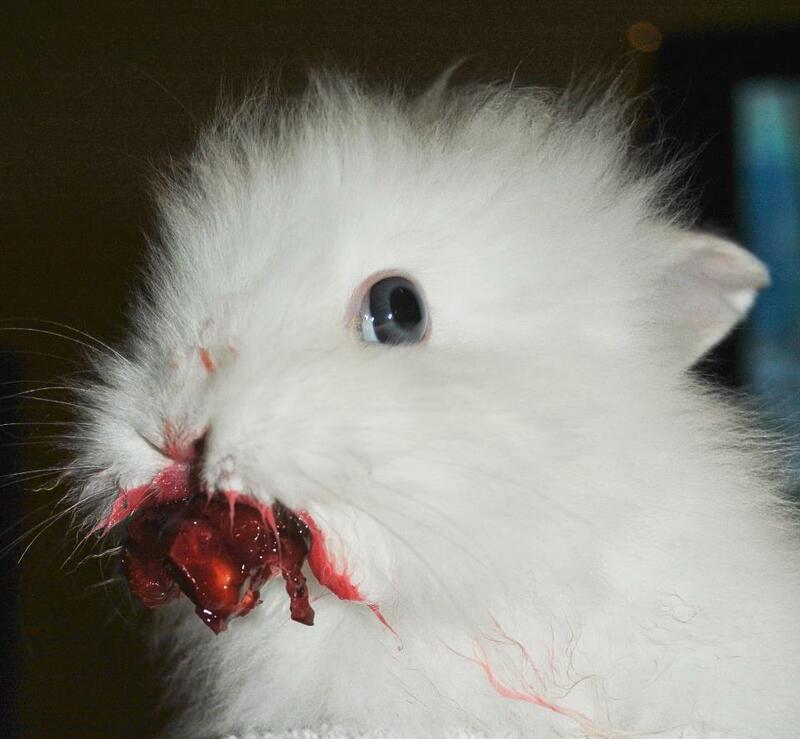 I hadn’t seen the gory pic of the cherry eating bunny, poor thing, looks like he’s eating someone!